One of the winter projects this year is to replace the old incandescent cabin lights with LEDs. The incandescent bulbs consumed too much energy, which became a problem on week long sailing trips - or even multi night trips. I first looked at getting LEDs shaped to replace the incandescent bulbs - so I could still use the old cabin light fixtures. However 2 of the 5 square plastic cabin light fixtures were missing covers, and some of the switches were corroded. We looked further and found some LED cabin light fixtures that had white lights and also red lights to save a sailor's night vision. Following the age-old adage, "a product which takes 'night vision' into account must be a good product", we ordered 5 of them. The light is from Sea Dog. It has 5 red LEDs and 15 white LEDs - with a 2 way switch to select one or th e other. The light gives the equivalent of a 15 watt bulb, but only draws 0.68 amps. The new round dome lights were large enough in circumference to cover the holes from the old ligths, so we didn't have to deal with patching any holes. The red night vision lights would come in handy. I can remember several occasions standing at the helm at night, trying to spot unlit channel buoys. Inevitably someone down below would flip on a cabin light "just for a second" and the helmsman would be blinded for a few moments afterward while his pupils dilated again. We decided that if necessary, we would rewire the light switches so flipping them to the right would turn on the red light. Easy to remember, "right on red" as in "right on red returning". (If we sail to foreign ports with different conventions, we'll have to rewire...) Luckily, all of the lights shipped with this convention so we didn't have to change anything. 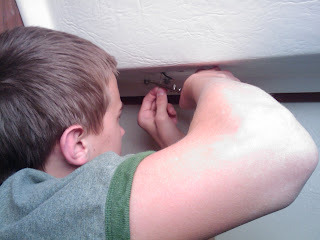 I employed the younger crew in disassembling the old lights, which turned out to be a very fun project. The kids liked climbing beneath the snow-covered tarp to work on the boat. There's something very wrong about snow on a sailboat. With a couple of us inside the boat, and a blanket of snow on the tarp, the boat warmed up comfortably so we only wore jackets while working on the electrical system. Removing the old lights was very straightforward, just pull out a couple of screws and the lights came off easily. It only took a few minutes to remove all the old lights. I was glad I'd replaced the entire fixture rather than just replacing the bulbs, because several of the switches were badly corroded. We were amazed to find a substantial colony of dehydrated Brine Flies entombed behind several of the old cabin light fixtures. No doubt these were a remnant of our Great Salt Lake adventure. Installing the LEDs was fairly easy, once we got the process down. First we crimped waterproof connectors to the pigtails from the new LED lights. I read in Don Casey's "Sailboat Electronics" book that the test for a good crimp job was to pull hard on the connection - if it comes apart then it wasn't a good connection. Once the wires were connected we melted the ends of the waterproof connectors with heat from a lighter (being careful not to catch the fiberglass on fire!) Then three small pilot holes were drilled for the mounting screws, and we were done! The new lights are much brighter than the old, and more importantly, the 5 LED lights together now consume as much electricity as a single incandescent bulb did before.